Clockmaker Miki Eleta has teamed up with Marc Jenni to produce the Timeburner, a watch inspired by the internal combustion engine that features a piston minutes display. A self-taught clockmaker who specialises in complex, sculptural skeleton clocks, Miki Eleta hails from Bosnia but has lived in Switzerland since 1973. Now based in Zurich, Eleta teamed up with independent watchmaker Marc Jenni to realise the Timeburner a hand-wound wristwatch with piston minutes display. The Timeburner is inspired by the pistons inside the cylinders of a reciprocating internal combustion engine, an automotive theme that is reminiscent of the Urwerk and MB&F Nitroglycerin colloration. An aluminium piston moves the minute display, which travels on a linear track, showing the minutes as they pass. It travels inwards towards the 30 minute mark, then reverses and moves outwards towards the top of the hour. Hours are shown in the window at six o’clock on a disc that turns continuously (it is not a jump hour mechanism). Fellow AHCI member Marc Jenni collaborated with Eleta to make the movement, which is based on the Unitas 6497-1, a robust hand-wound movement originally designed for pocket watches. A large mainspring makes it useful for complications that require significant torque, like a piston indicator. The Timeburner has a 48 mm wide case, with the minute display accounting for nearly half that diameter. It’s made of steel with the bezel and crown in untreated bronze that will develop a patina. Three models are available, the Silverlight ME1 in polished and bead blasted steel, the Chrome-Rider ME2 with a partially black coated case, and the All-Black ME3 that is self-explanatory. Each version of the Timeburner is limited to 99 pieces and priced at 12,673 Swiss francs. It’s available from Eleta Timepieces. 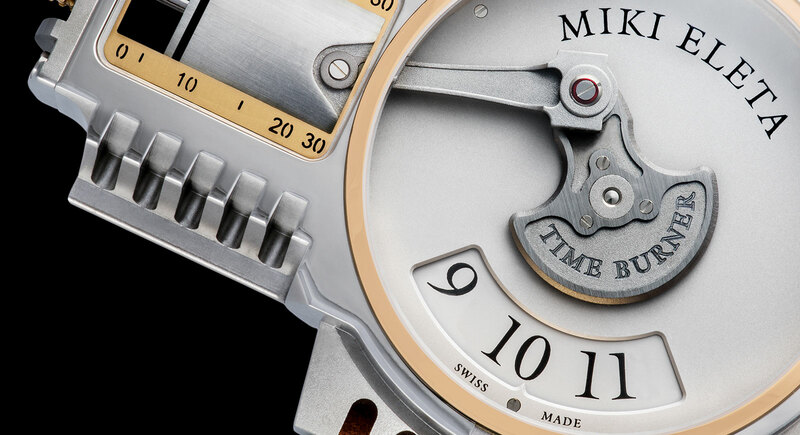 Update 2 April 2015: Miki Eleta has revised the price of the Timeburner downwards to 7750 Swiss francs, paradoxically due to strong demand for the watch. Eleta explains that allows him to buy components in larger quantities at lower prices, hence the new lower price. All buyers who paid the higher, initial price will receive a refund of the difference. Speake-Marin returns with the Spirit Mark 2, which is literally bigger and better than its first sports watch. MB&F unveils the final run of its most successful timepiece, the HM3 MegaWind Final Edition. Clad entirely in black and grey with contrasting Super-Luminova accents that glow vivid green at night, it really comes alive after dark.